So Much More than just Great Tasting Water! 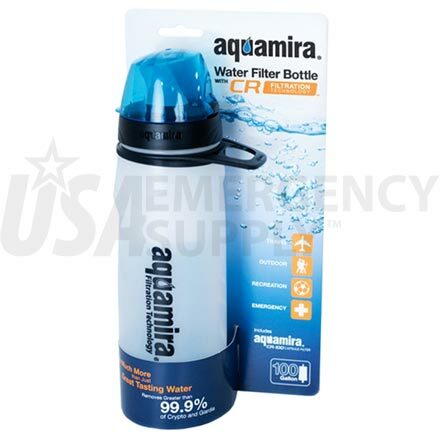 The New Aquamira® Water Filter Bottle provides a lightweight, easy-to-use supply of safe drinking water. Aquamira CR Filtration Technology™ not only removes chlorine, bad tastes and odors, but it also removes over 99.9% of Cryptosporidium and Giardia; the two leading causes of waterborne illnesses. Aquamira CR filters have been tested and proven effective in removing Cyanotoxins such as Microcystin and other biotoxins. Designed for Ease of Use: The newly designed Aquamira Water Bottle is ergonomically shaped to fit comfortably in your hand, in standard cup holders, or bicycle cages. The additional "Finger-Grip" carry loop allows you to carry the bottle with one finger, or secure it to backpacks. Constructed of BPA free LDPE plastic, the Aquamira water bottle is easy to squeeze, when higher flow rates are desired. The patented BITE-ME™ valve provides high flow rates, leak-free shut-off and will not pinch your tongue. To learn more about the technology behind the new Aquamira Filter Bottle, click on the TECHNOLOGY button above. Aquamira® CR Filtration Technology™, consists of a formulation of activated coconut shell carbon, porous plastic and other proprietary filter aids. The components are molded under controlled heat and pressure in a process know as "sintering". The result is a solid, but porous block structure with uniform pore distribution, high flow rates and long filter life. Testing and Certification, All Aquamira CR rated filters are tested in accordance to NSF 42 protocols to reduce chlorine, taste and odor. CR rated filters are also pre-tested in accordance to NSF 53 protocols to remove more than 99.9% of Cryptosporidium and Giardia.